When I was a child I lived in Peddars Lane with my mother. 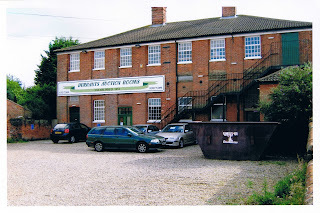 We lived next door to what is now Durrants Auction Rooms but the building itself has a rich history, starting out life in 1856 as a Silk Factory and later becoming a School. I have long been curious about the buildings in my childhood street and have been researching the history of the Lane for many years. I discovered there was a School in Peddars Lane as far back as 1837 when there was a School for the Non-Conformists. The Pigot's Directory of 1839 listed a British School in Perry's lane and the Robson's Directory, also of 1839, listed a British & Foreign School in Pedlars lane (During my research into the history of the street, I have found Peddars lane spelt in all manner of different ways). 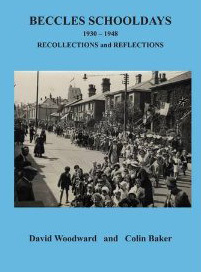 Unfortunately, I haven't been able to find any photographs which show the original school in Peddars lane so I'm not sure where exactly it was located but it is believed to have been "the building beside Peddars lane now used as a Nursery next door but one from the Silk Factory, on the west side" [source: David Lindley, Beccles historian]. The 1870 Education Act proposed the setting up of School Boards and one was set up in Beccles in 1872 which composed of three Church of England members and two Dissenters. 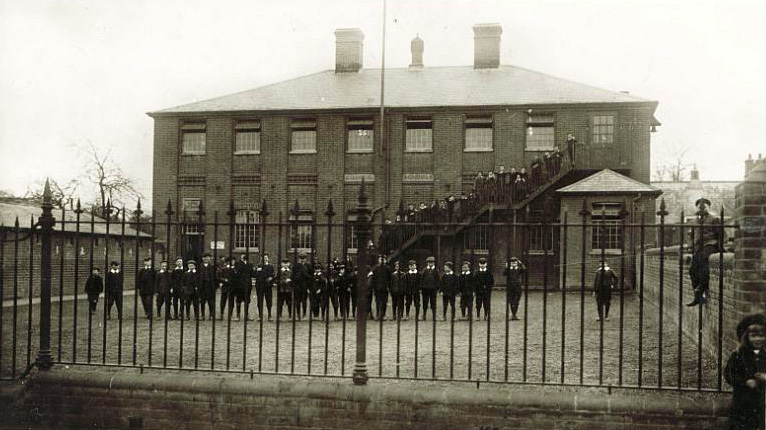 The British School officially became a Board School in 1877 and moved into the old Silk Factory building, after extensive alterations had been made. "The Rev. F.F. Tracy, rector of Beccles, attended the Court to make a statement relative to the behaviour of the youths of the town. He said that the state of the town had led one to believe that special efforts ought to be made to instruct the youths, and night schools had been established for that purpose..."
The article goes on to explain that a Sunday School had also been opened in Peddars Lane but that the teachers were under constant threat and attack, one youth throwing a stone at a teacher after being sent off from the grounds (The East Suffolk Gazette went so far as to report the name of the said youth as being Spratt). Another youth threw a jug of water at the Rector and a whole class was turned out after using profane language. When a teacher went to visit the parents of the children in question he was surrounded by a mob of boys who used obscene language as he walked down the street (Again, the East Suffolk Gazette reported that it was the Superintendent of the School who asked a boy to take him to the home of the parents). The East Suffolk Gazette, also dated 7 December 1875, reported further to the unruliness of the youths by stating that at a night school for art classes, a teacher found a boy not connected with the class and put him out. He was immediately surrounded by boys crying, "Round up!" and pelted him with stones, one of which injured a pupil teacher. Rev. Tracy appealed to the Police Court that he was only there for advice and not wanting to involve the police in any further action, unless absolutely necessary, against the youths in question. Tracy was assured by the Chairman (Rev. R.C. Denny) that he would merely give the police instruction to "watch" the youths and act only upon any evident obstruction of justice. Further to the identification of the boy Spratt, I looked into the 1871 census and found two families in Beccles. One family was living in Swine's Green: William Spratt and his wife Elizabeth with their four children, three of whom were boys. 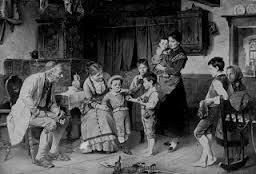 In Ingate Street there was an Ebenezer Spratt living with his wife Caroline and their three sons. It is believed that William and Ebenezer were related, both were born in Beccles. Frederick Francis Tracy was Rector of Beccles at Ballygate Street. He was officiated at Beccles in May 1872, being late of St Pancras, Chichester. He was born around 1829 in St James, county Middlesex, and in 1857 married Adelaide Borrer. He resigned from his post as Rector of Beccles in 1882 and Rev. John Rowsell, minister of St John, Beverley, Yorkshire was appointed to take his place. "The old factory building has been altered so that both boys and girls are under one roof, the girls taking the ground floor and the boys the upper storey. The entrance to the girl's school is at the west end, where there is a small room fitted up with pegs, then comes the commodious and well-lighted school room, in front of which are two spacious classrooms. each with its fireplace and ventilation apparatus. At the east end is a small room fitted up with a lavatory. At the rear is a large yard for a playground. The boy's entrance is at the west end, the playground in front. A flight of stone steps leads up to the school rooms. The ground floor ceiling has been "pugged" with clay, between two and three inches thick, with a view of deadening the sound. Mr Bull of Ditchingham has done the bricklaying, Mr Botwright of Bungay the carpentering, Mr Holley of Bungay the painting, and Mr Pearce of Norwich is architect to the Board." The 1900 Kelly's Directory states the Board School of Peddar's lane was erected in 1877 for 254 boys, 176 girls and 299 infants. New class rooms were added to the boys and girls schools in 1895, each for the accommodation of 60 children (The East Suffolk Gazette reported on 6 August 1895 that the new school rooms were well ventilated and that Mr WM Crowfoot was very happy to say that for many years past the school had obtained most excellent reports from the HM Inspector!). In 1901 Beccles architect, Arthur Pells, had advertised in the Gazette for Tenders to pull down three cottages for the purpose of erecting a new Infant's school in Peddars lane (These three cottages made way for part of what is known today as the Albert Pye School) and in 1903 the new school for 250 children was opened. By 1912 the Peddars lane Board School was known a Council School and it remained so until its closure somewhere around the 1960s. I loved this blog, what an interesting history the building has! Just came across this by chance while checking my father's history. He was born in Beccles and went to this school around 1920. I thought he always said the building used to be a workhouse, but this does not seem to be the case from your article. Thanks for posting this. Hello Laurence, thanks for your comments. I don't believe the Peddars Lane School was a workhouse. The only workhouse in the Beccles area (that I am aware of at least) is the Wangford Union Workhouse in Shipmeadow which was situated appx. 3 miles from Beccles on the road to nearby market town, Bungay. Hope this helps. Thanks for your reply. I remember Dad pointing out the Shipmeadow workhouse as we passed when I was a child, so maybe either I was mixing the two buildings up or he just said the school looked as if it was a workhouse (which is perhaps true). Before this was the Auction Rooms it was an antique centre. I had a place there. Part of the rent was paid in giving time to being on duty there and it was absolutely freezing in the winter! Thanks for leaving a comment Robert, I appreciate it. Tell me, who was your great-gran? I lived in those cottages in the 1970s until they were going to knock them all down. Turned out they refurbished them instead and they're still standing. Hi there, I just wanted to ask if by any chance you knew anything about the building 1a Peddars Lane at all? It is the single story dwelling just after the London Road junction before the bungalow and cottages. I h Ave recently purchased 17 London Road and the building is now part of that. It has 2 rooms, kitchen and bathroom in but looks like it has not been lived in for years. I'd love to know a bit more about it but I'm struggling to find anything out.